Not only has the Internet completely transformed how we operate on a day-to-day basis, it’s opened a whole new world of opportunities and possibilities to creative entrepreneurs. Yes, even ones with ridiculous and outrageous ideas. Last year, then-22-year-old entrepreneur Matthew Carpenter started this website as a joke playing off what people want to do to their enemies (Carpenter called glitter "the herpes of the craft world). But after iShip Your Enemies Glitter went viral, the site had approximately $20,000 worth of orders virtually overnight. So many, in fact, that Carpenter suspended new orders and decided to sell the website. It quickly changed hands for a cool $85,000. A six-figure payout in less than 10 days wasn’t too bad, considering the majority of that revenue was profit. The cost of goods sold was minimal, although the task of filling all of those envelopes with glitter must have been daunting. Several other glitter-bomb websites launched after this success story, but they more than likely haven’t experienced the same financial gains as the original. If you visit the website today you will see that the new owner has also introduced several additional gag products, further proving there really is a market for these ridiculous ideas. Today’s online generation thrives on sharing funny pictures and videos -- and this product is correctly aligned to command a piece of that attention. 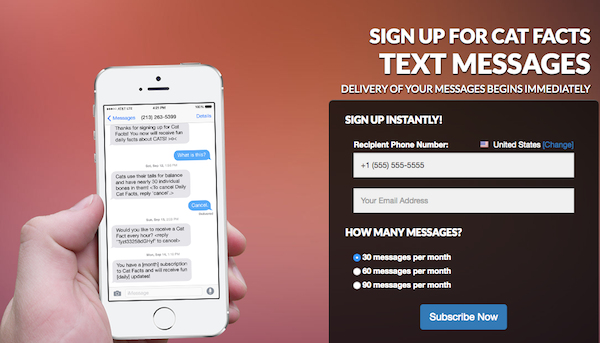 Want to bombard someone with 30 to 90 text messages containing random cat facts every month? If this is exactly what you have been looking for, your are in luck, because for as little as $2.99 per month you can make sure your friends (or enemies) receive at least one new cat fact daily. Yes, Cat Facts is a real service. If you think this is a completely insane idea, do this for me: Go to YouTube and type “cat videos” into the search bar. The top organic result the day I'm writing this has more than 95 million views. Keep scrolling down and look through the first few pages of results. There are endless cat videos with millions of views, proving there is a huge market for cat-related services. Yes, even services that flood your cell phone with cat facts. The message here: The Internet provides entrepreneurs with endless possibilities, and you will never know if your idea is a stud or a dud unless you go for it. Do you have an idea for a business -- mild or wild -- and want some real-world feedback? Join the free online community for entrepreneurs and business owners I started here.